Aardman Animations have been a shining light in British animation since the early days of ‘Wallace & Gromit’, and ‘Early Man’ is their latest feature film to hit cinemas. The film combines the unlikely companions of the prehistoric world and football (with significant artistic license taken!) and follows a group of cavemen who try to save their valley by winning a game of football against their better equipped ‘Bronze Age’ rivals. The film is very funny with a good mixture of clever wordplay and slapstick comedy, and there’s some football related easter eggs that fans of the sport will definitely enjoy looking out for. Our hero is Dug (Eddie Redmayne), a young caveman who wants his tribe to achieve something great against the traditional ideals of the tribe’s leader Chief Bobnar (Timothy Spall). That opportunity is presented when the tribe are driven out of their valley by Lord Nooth (Tom Hiddleston), a representative from the nearby Bronze Age city who has set out to literally put the Stone Age into the history books. When Dug discovers the popular sport of football and a link to the cavemen’s ancestors, he sets out to whip his tribe into shape in order to take the game to ‘Real Bronzio’ and reclaim their home valley. It’s a classic David v Goliath setup and the plot doesn’t deliver many surprises, but I laughed a lot and enjoyed the way the story played out. 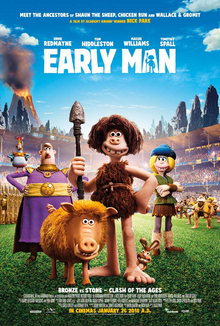 ‘Early Man’ isn’t vintage Aardman, but it’s a really likeable animation with a good voice cast and I had a lot of fun watching it.